In NH-eNews this week our NHD featured article is looking at the benefits of Iron. Please scroll down for more information. NHD also continues to bring you the latest jobs and events. For more essential dietetic resources from NHD, please scroll down. nutrition news stories, events, debates and much more. Visit NHDmag.com for the live feed. Benefits of iron for sports and exercise. Vitaflo® International Ltd wishes to inform you that from 31st December 2015* Vitasavoury 200 is being discontinued from our nutrition support product range. Vitasavoury 300 is available as an alternative in all flavours. NHD Magazine is printed six times a year and has an additional four online only editions, all of which can be viewed on our website or via the free NHD app. 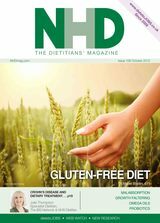 Now in a handy 'digest' size, NHD makes for a great read: an essential resource for all dietitians and health professionals. Subscribe to NHD Magazine here... today. Would you like to write for NHD? To see our full list of events and courses, click here..
NH-eNews is now sent to 7,500+ requested email addresses consisting of dietitians, nutritionists, student dietitians, food industry personnel, pharmacy managers, GPs, nurses, catering managers and other professionals with an interest in nutrition issues. Copyright 2015. All rights reserved. NH Publishing Ltd.